Breast cancer recovery is a delicate time, a time to be respected for the hard-won healing that is taking place, as well as the physical and emotional complexities that may arise. Women recovering from breast cancer face many challenges, not only in getting their strength and energy back but in many cases, strengthening their self-confidence. Exercise, and specifically pilates, can aid breast cancer recovery, according to an occupational therapist and fitness instructor Naomi Aaronson, MA, OTR/L, CHT. She is a Pilates mat instructor as well as an author, presenter, and continuing education provider for several fitness organizations. Aaronson shares her insights into how survivors can benefit from exercise. Fatigue, limited range of motion, and even fear of moving sore areas may make a woman shy away from exercise. The right kind of exercise, though, guided by trained professionals, can be of great benefit for women recovering from breast cancer. One of the best things about exercise is that it can be relaxing and energizing at the same time. Women in recovery are often fighting stress and fatigue. Increasing energy levels and reducing stress, then, are very important—as they are for most of us. In addition, regaining strength and range of motion in the chest, shoulders, back, and arms will help a woman care for herself and resume her normal life. Gaining independence also goes a long way toward a sense of emotional empowerment. An added benefit of exercise is that moving muscle also moves lymph fluids. This helps keep lymph from building up and possibly causing lymphedema, one of the significant risks of breast cancer surgery. Women recovering from breast cancer may feel extra protective of their chest area. It may even take some time to feel comfortable standing up straight or doing more than the simplest of movements. At the early stages, an exercise program for breast cancer recovery will develop slowly. Simple moves, such as deep breathing and small stretches, can be used to enliven the body from the inside, without causing undue stress. While it is important to gently increase the range of motion in the chest, shoulder, and arm, for some women, this area may feel like a new landscape—with new sensations and sensitivities. The area may be stiff and sore, and it can be scary to move an area that is uncomfortable. Progressing slowly and steadily will help a woman gain confidence and get settled in her body. Over time, therapists and pilates innovators have found effective ways to modify Pilates exercises so that one can start practicing pilates from any level of fitness. 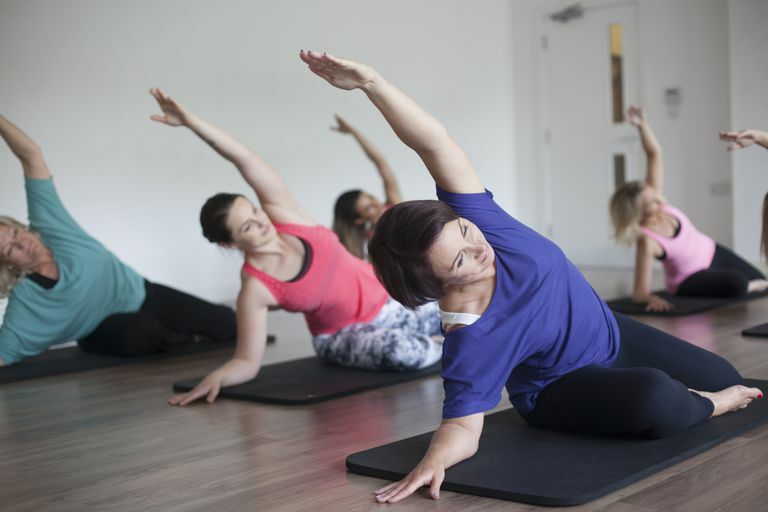 A woman starting out after a break from exercise, and possibly after difficult treatments, will find that, with pilates, she can still work from her core and build strength and flexibility. Some will appreciate that many Pilates exercises are done lying down, reducing the risk of a fall or overexertion. Pilates also helps deepen the body/mind connection, something many recovering women are ready to explore. Centering, concentration, control, precision, breath and flow—these pilates principles, the foundations of Pilates movement, provide integrative links between body and mind. A fundamental part of Pilates exercise, deep breathing tops the list of exercises for women in recovery. It is enlivening, stress-reducing, and it works the core muscles. Examples of pilates breathing exercises that women in early stages of recovery may begin to practice are diaphragmatic breathing and pilates lateral breathing. Simple exercises that strengthen the abdominal muscles and back help support good posture, which translates to more stability and freedom in everyday movement. Plus, being able to maintain good posture goes a long way toward helping women feel more self-assured. Exercises, such as a small bridge or pelvic clock, will work the back and abs without challenging the chest and arms too much. Light stretches done with good alignment (a pilates prerequisite for everything) help women regain full range of motion through the chest and arm. angel arms, where the arms float up to the sides, maybe halfway to start, is a good example. Also, arms reach/pull, where you pull the shoulder blades together and push them apart, is an exercise that is done a lot in pilates that also shows up in initial breast cancer recovery programs. Yes, the above are examples of pilates fundamental moves that Aaronson hopes will encourage recovering women to rebuild themselves, both physically and emotionally. However, it is very important to find instructors who have adequate training in working with breast cancer recovery. Fortunately, many physical therapists are including pilates training in their skill sets. Also, there are fully certified Pilates instructors who are trained in working with appropriate modifications for rehab clients. If lymphedema is present, one should consult with a certified lymphedema therapist. Women who have had lumpectomies or mastectomies will probably be most comfortable exercising in a sports bra or camisole. Plan to build an exercise program slowly, in stages. Know that there may be some discomfort and that can be a little scary. Work with your therapist or instructor to make sure you are safe and as comfortable as possible. Exercise may elicit some emotions—that is OK. Sometimes the chest area will feel very different from how it used to feel and it can take time to get used to that. There may even be some loss of feeling. In Pilates, we don't do a lot of repetitions; we go for quality. That may be a good motto for any exercise a woman in recovery chooses to do, especially at first. Schmitz K. "Physical activity and breast cancer survivorship." Recent Results Cancer Res. 2011;186:189-215. doi: 10.1007/978-3-642-04231-7_8. Eyigor S, Karapolat H, Yesil H, Uslu R, Durmaz B. "Effects of Pilates exercises on functional capacity, flexibility, fatigue, depression, and quality of life in female breast cancer patients: a randomized controlled study." Eur J Phys Rehabil Med. 2010 Dec;46(4):481-7.